Pastured pigs bred, born and raised on the farm are humanely treated and are never given any weird stuff. Higher in healthy Omega-3 fatty acids and other vitamins, pasture-bred meat is also known to have superior flavor. Sugar Mountain Farm offers Certified Naturally Grown pork that City Market is proud to have available for our customers! Sugar Mountain Farm is the home of Walter and Holly Jeffries and their three children in West Topsham. Walter and Holly started raising sheep in 1989 but switched to pigs in 2003, explaining the switch as, “Sheep don’t pay the mortgage.” The sheep, however, did earn their keep. When the Jeffries started raising pigs, they wanted to avoid feeding grain as much as possible. I have trouble believing it, but Walter claims the sheep taught the pigs that grass and hay are good to eat! 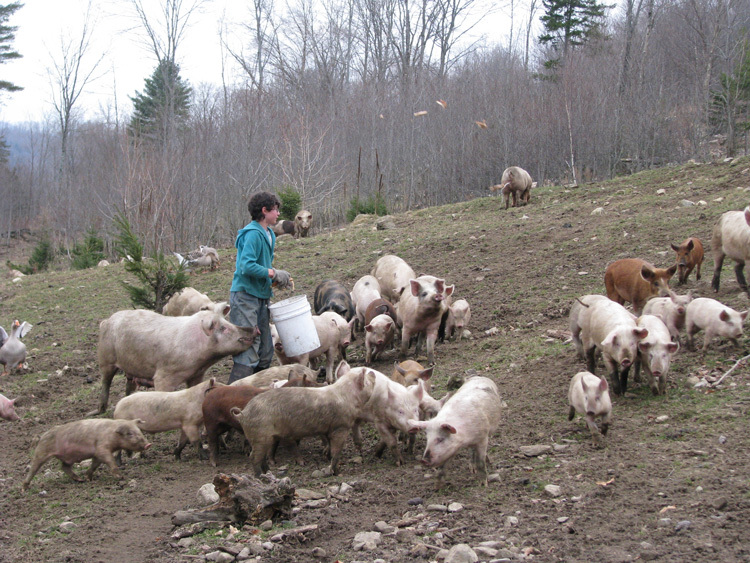 The hillside of Sugar Mountain is now home to 300 pigs, rotationally grazed on 73 acres. The pigs eat only pasture, hay, pumpkins (grown at the farm) and whey (mostly from Vermont Butter & Cheese Company). When asked why he started farming, Walter explained that there were no meats available that he felt comfortable feeding his children. By raising his own animals, he could guarantee that the meat was produced without hormones, antibiotics or genetically modified organisms and that the animals were raised humanely. Can there be a higher testament to quality than meat the farmer raises to feed his own children?